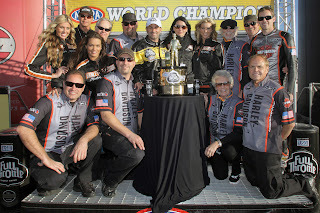 Las Vegas, Nev. – The Harley-Davidson® Screamin’ Eagle®/Vance & Hines Pro Stock Motorcycle drag racing team wrapped up a historic season by earning a win and a championship at the 48th annual Automobile Club of Southern California NHRA Finals at Auto Club Raceway. Team rider Andrew Hines rode a Harley-Davidson® V-Rod® to his sixth win of the season, defeating his teammate, Ed Krawiec, in the seventh all-Harley final of the season. 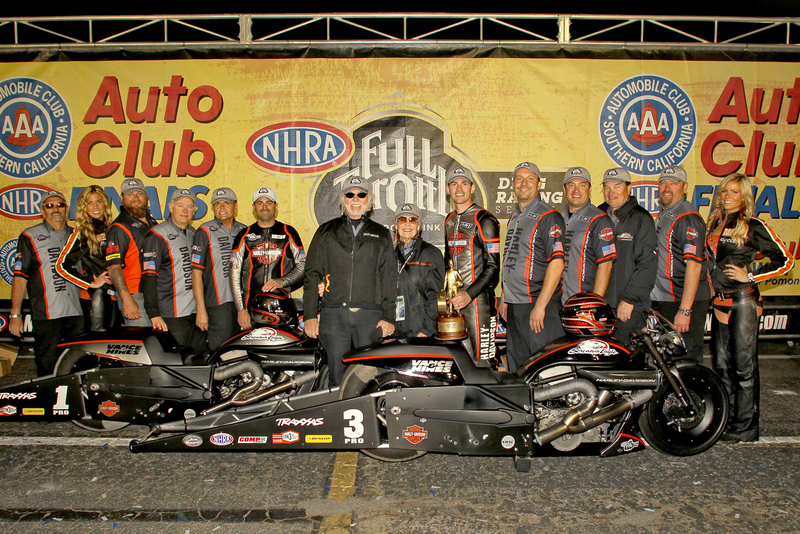 The win by Hines caps a season that saw the Harley-Davidson® Screamin’ Eagle®/Vance & Hines team win 15 of 16 NHRA Pro Stock Motorcycles events. Krawiec was able to celebrate winning his third Pro Stock Motorcycle championship on Saturday. 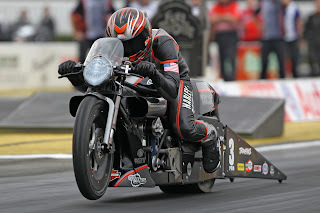 By qualifying his Harley V-Rod in second position for Sunday eliminations, the 35-year-old rider from Englishtown, N.J., secured enough points to lock up the 2012 title. 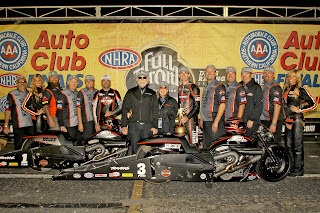 Hines had a hot hand and a very fast Harley V-Rod all weekend at Pomona. He set the low Elapsed Time (ET) in eight consecutive rounds, including a track-record 6.809-second blast in the final round of qualifying to bump Krawiec (6.811 ET) off the pole. On Sunday, Hines advanced to the final round with wins over Kosman Special Buell rider James Surber, Suzuki rider Steve Johnson, and Matt Smith on the Viper Motorcycle Company Buell. Krawiec scored a win over MB Precision/LAT Racing Buell rider Mike Berry in round one, and got an automatic win in round two when Geico Suzuki rider Karen Stoffer fouled at the start. Krawiec defeated ZLOOP Suzuki rider LE Tonglet in the semi-finals. In the final, Hines powered past his teammate, winning with a 6.766 ET to re-set the track record and also record the best top speed of the event at 198.29 mph. Krawiec’s 6.805 ET was his best of the day. Krawiec sits atop the final season standings with 2,773 points. Hines is second with 2,691 points. Lucas Oil Buell rider Hector Arana Jr. is third with 2,502 points, followed by Hector Arana Sr. on a Lucas Oil Buell with 2,432 points. Stoffer is fifth with 2,386 points. Harley-Davidson Motor Company produces heavyweight custom, cruiser and touring motorcycles and offers a complete line of Harley-Davidson motorcycle parts, accessories, riding gear and apparel, and general merchandise. For more information, visit harley-davidson.com. 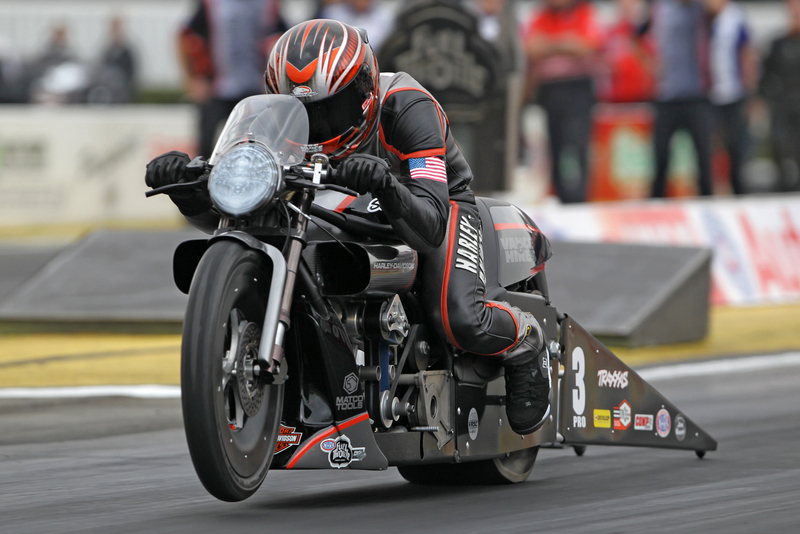 The Harley-Davidson Screamin' Eagle/Vance & Hines Pro Stock Motorcycle team is sponsored by Matco Tools, Dunlop and Traxxas. Will YOU win this Indian Chief Classic? !